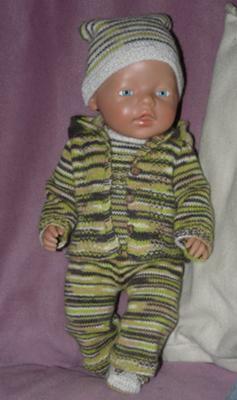 The pattern used is 009 John. I tried to obtain a boy touch because this Baby Born is owned by my 3 1/2 years old son. I had a great time looking for yarns and knitting this beautiful pattern. This turned out so cute for your son's boy doll. I love the yarn you used making this outfit. I bet your son loves his doll. You did a good job here! Her doll looks great! I imagine that your son is very pleased with this great outfit for his doll! The striping is a great effect for a little boy. Such a cute outfit. Your color choice is perfect for a boy.